Nearly one billion people do not have access to clean, safe water – that’s the equivalent of 1 in 8 people on the planet! In Africa, preventable waterborne illnesses claim the lives of millions of people each year. No single organization can resolve Africa’s water crisis, but together, with a combination of civil society, non-governmental organizations and government, we can make a positive difference on Africa’s water challenges. The Replenish Africa Initiative, or RAIN, is therefore the signature community initiative of The Coca-Cola Africa Foundation. Backed by a six-year, $30 million dollar commitment by The Coca-Cola Company, in partnership with other donors, RAIN’s goal is to provide over 2 million people in Africa with access to drinking water by 2015. RAIN will launch over 100 water access programs across Africa, including sanitation and hygiene education programs. 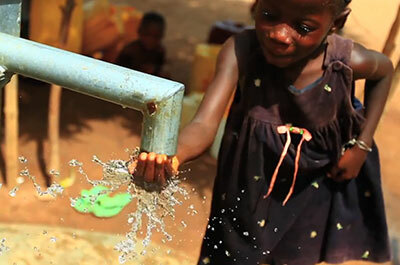 The Coca-Cola Africa Foundation has been involved in community water programs since 2005. To date, 42 water projects in 27 countries have been supported, in partnership with and co-funded by USAID (United States Agency for International Development) under the Water and Development Alliance (WADA) and other partners. Within The Coca-Cola Company’s three-tier global water stewardship strategy which is focused on Reducing, Recycling and Replenishing the amount of water used in Coca-Cola beverages and their production, The Coca-Cola Africa Foundation’s focus is on Replenishing – or community based water interventions. According to The Water Project, with much of one’s day already consumed by meeting basic needs, there isn’t time for much else. The hours lost to gathering water are often the difference between time to do a trade and earn a living and not. Just think of all the things you would miss if you had to take three hours out each day to get water. In collaboration with various partners, volunteers, patrons and organizations, RAIN is not just for the immediate future of Africa, but also for the long-term sustainability of its resources. RAIN is also The Coca-Cola Company’s contribution to help Africa meet the UN Millennium Development Goal on water and sanitation.